Be the first to share your favorite memory, photo or story of Lydia. This memorial page is dedicated for family, friends and future generations to celebrate the life of their loved one. 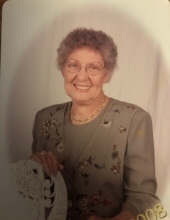 Lydia Alice (Brown) Cable, 80, of Brodhead, passed away Saturday, September 15th, at the Rockcastle Health and Rehab. She was the widow of Norman Keith Cable, Sr. who preceded her in death on February 23, 2000. Lydia was born in Lincoln County, Kentucky on December 19, 1937. She was a daughter of the late Dan L. and Dovie (Hayes) Brown. Lydia was a member of the New Hope First Church of God. Several nieces, nephews, friends and neighbors also survive. In addition to her husband and parents, Lydia was preceded in death by 3 Brothers, Dallas, Alonzo, & Hubert Brown and a Sister, Luvenia Wilson. Funeral: 2pm Tuesday at McKnight Funeral Home with Bro.Robbie Cable and Bro. Marshall Malone officiating. Burial will be in the Providence Church of Christ Cemetery. Visitation will be after 5pm on Monday at the funeral home. To send flowers or a remembrance gift to the family of Lydia Brown Cable, please visit our Tribute Store. "Email Address" would like to share the life celebration of Lydia Brown Cable. Click on the "link" to go to share a favorite memory or leave a condolence message for the family.